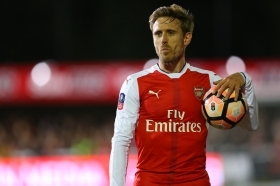 Arsenal have reportedly triggered a clause available on Nacho Monreal's contract to extend his stay until the end of the 2019/20 season. The Spaniard has spent the past six years with the Gunners and he has gone on to make 227 appearances for the north London side in all competitons. According to ESPN, the Gunners have triggered a 12-month option attached to the defender's contract with his existing deal initially due to expire in the summer. Still, the Capital outfit could receive transfer interest from the likes of Athletic Bilbao but they seem to have given themselves time until the summer to decide the left-back's future. Monreal has been struggling with a calf problem over the past month but he is expected to return to action when the Gunners take on West Ham United on the road this weekend. Arsenal are currently just three points behind Chelsea in the race for the final Champions League spot and a derby triumph could put them within striking distance of the Blues, should things go their way.